Miami Springs was founded by Glenn Hammond Curtiss and James Bright during the land boom of the 1920s and originally named Country Club Estates. The city was incorporated in 1926 and shortly after renamed as Miami Springs. 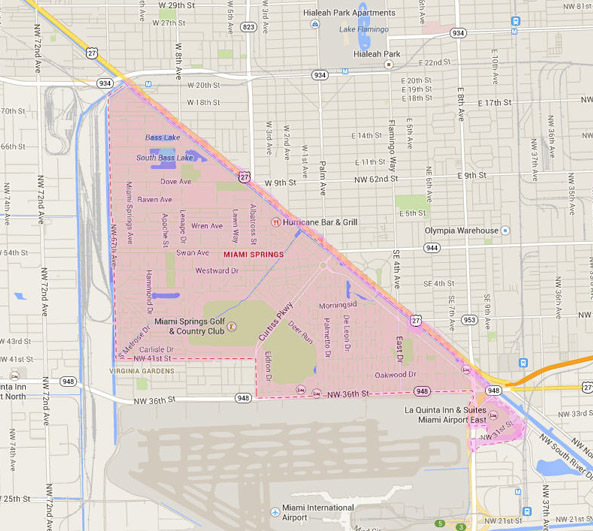 It is located north of Miami International Airport and South of Hialeah with a population of over 13,800. Glenn Hammond Curtiss was an American aviation pioneer and a founder of the U.S. aircraft industry. Glenn thought the area was desirable for starting a flying school in 1916 with James Bright, his partner, and together they purchased 17,000 acres of pastured land. Years later, the land developed to become Miami Springs, as well as Hialeah and Opa-locka. Glenn built his family home in Miami Springs, known as the Miami Springs Villas House, or Glenn Curtiss House, which over the years had been refurbished and repaired to serve as a museum in his honor. The original architectural style that developed in Miami Springs was a Pueblo Revival design, which was influenced by the southwestern New Mexico style. There were other buildings that incorporated more of a Mission style. Fair Haven Nursing Home is one of the oldest buildings in Miami Springs with pueblo style architecture, originally serving as a hotel and at one point as a sanitarium that was in accordance with the ideals of John Harvey Kellogg, an American medical doctor and one of the founders of Kellogg’s whole grain cereals. Today, Fair Haven Nursing Home provides extended-stay nursing care to seniors with varying levels of disabilities. After incorporation, the city changed its name from Country Club Estates to Miami Springs because of a fresh water spring located in the area that provided Miami water up until the mid 1990s. Since the city is located just north of the Miami International Airport, the airline industry has brought many residents from airline crew bases to the area. Besides the Glenn Curtiss House and Gardens, there are other historical sites within Miami Springs. The George Carl Adams House was built in 1925 as part of the Hunting Lodge Park section of the community. It was the second largest home in the community at the time. George Carl Adams was the half brother and business partner of Glenn Curtiss in several real estate and commercial ventures, such as building all the roads and sidewalks to Opa-locka, Hialeah and Miami Springs. Another historic site is the Miami Springs Woman’s Club, built in 1949 with Art Deco style and some elements of Pueblo Revival Style. The club was founded in 1939 and since then, the club has been a significant charitable, educational and social presence in the community. Some of the schools designated for Miami Springs include Miami Springs Elementary, Miami Springs Middle, Miami Springs Senior High, and Springview Elementary. Miami Springs Senior High School is known for their national magnet program specializing in tourism and travel since 1987. The school was established in 1964. Miami Springs Middle school was built in 1955 and has a magnet program of science and engineering and an honors program. Some of the private schools designated for Miami Springs include Blessed Trinity Catholic, Grace Lutheran Learning Center and All Angels Academy. Miami Springs Golf and Country Club is one of the places visitors can go to unwind and relax while playing a game of golf. The parks in Miami Springs include Prince Field, Stafford Park and Peavy-Dove Park. Prince Field has a football field, 2 baseball fields, picnic pavilions, and a children’s play area. Stafford Park has 2 soccer fields, 1 baseball field, 1 softball field, and a children’s play area. Peavy-Dove Park has 1 speedball field, 4 tee-ball fields and a children’s play area. Like other areas in Miami, the community of Miami Springs began its history in the early 1900s and since has developed into the community it is today; a great place to live, work and play. There are many places to visit and it is conveniently located by the Miami International Airport for visitors and those that enjoy traveling. Most of the generations that live in Miami Springs continue to raise their families in the community because of its child-friendly atmosphere and recreational amenities. Miami Springs is known for caring about its history, environment and value of life. If you have any interest living in Miami Springs, contact us and we will assist you with your real estate needs.